Middle East Perspectives by Rick Francona: U.S. downing of Syrian Air Force aircraft - why are the Syrians attacking the SDF? 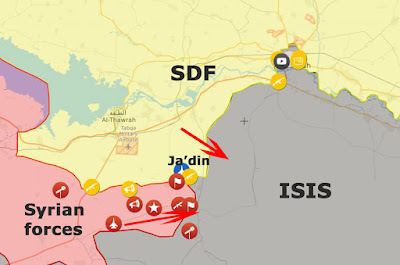 U.S. downing of Syrian Air Force aircraft - why are the Syrians attacking the SDF? In the mid-afternoon hours of June 18, a U.S. Navy F/A-18E Super Hornet fighter jet shot down a Syrian Air Force Sukhoi SU-22 (NATO: FITTER) fighter-bomber after it conducted an airstrike on positions of the U.S.-backed Syrian Democratic Front SDF) about 25 miles southwest of al-Raqqah. According to the Syrian Ministry of Defense, the pilot is missing. This represents the first time the U.S.-led coalition fighting the Islamic State in Iraq and Syria (ISIS) has shot down a Syrian Air Force aircraft. The U.S. destroyed numerous Syrian aircraft on the ground with a Tomahawk cruise missile strike at Sha'yrat air base in April just days following a chemical attack on the city of Khan Shaykhun. I believe that when the investigations are complete, we will find that today's shoot down was the result of a miscalculation or a series of errors. There is no reason for the Syrian armed forces, in this case the Syrian Air Force, to engage in military operations against the SDF, especially in the area south of al-Raqqah. In this instance, both sides - the Syrians and the SDF - are fighting a common enemy: ISIS. There has been a tacit understanding between the SDF and government forces to cooperate in the fight against ISIS. Unlike the opposition Free Syrian Army, the SDF is not engaged in a fight to remove the regime of Syrian President Bashar al-Asad. The SDF represents a coalition of mostly Syrian Kurds Peoples' Protection Units (known by their Kurdish abbreviation YPG), Arabs and even Syriac Christians, all allied in the fight to remove ISIS from Syria. For a more complete analysis of this cooperation, please see my article: An alliance between the Syrian Democratic Forces and the Syrian government? 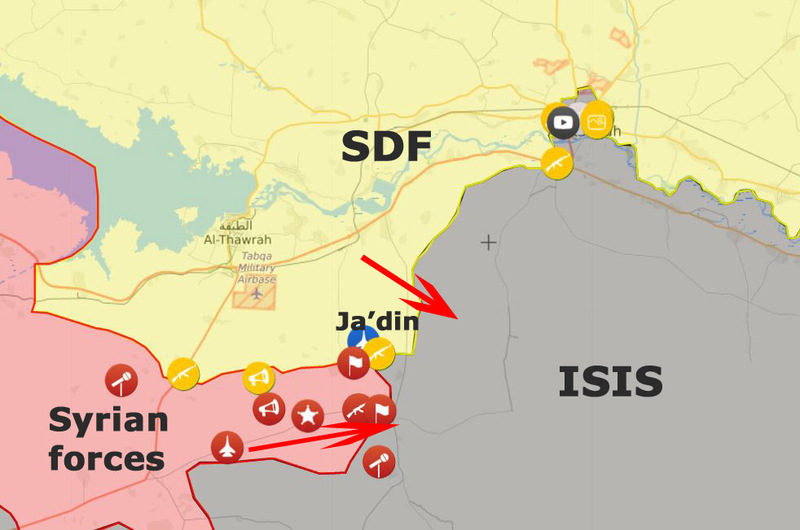 The action today occurred in the village of Ja'din, located in the area where the forces of ISIS, SDF and the Syrian government converge. The SDF and government are moving east almost on parallel tracks. The SDF is moving to completely surround and isolate ISIS units south of al-Raqqah and the Euphrates River in support of the main SDF force that is currently assaulting the city proper. Concurrently, and literally side by side with the SDF advance into ISIS-held territory, the Syrian Army and its allies are attacking east in an attempt to reach the besieged city of Dayr al-Zawr. The city and its adjacent air base have been under ISIS siege for over two years, relying on helicopter resupply for all necessities. Only massive amounts of Russian airpower has kept ISIS at bay. There is a second Syrian army effort attacking east towards Dayr al-Zawr from the city of Palmyra. The Syrian government is happy to let the SDF undertake the difficult task of securing al-Raqqah from ISIS while they focus on reclaiming Dayr al-Zawr. What happened today directly threatens that tacit cooperative arrangement. It is not clear what sparked the regime attack on SDF units in Ja'din, but it resulted in not only ground combat, but the first aerial combat between American and Syrian pilots. CNN's Pentagon correspondent Barbara Starr reported that the Russians and the Americans have been in discussions to lessen tensions and re-establish the "de-escalation" protocol between the Syrians and the SDF that appeared to be working. Hopefully, the two will be able to re-focus the fighting where it belongs - against ISIS. After ISIS is deprived of its territory in Syria, the parties can then work on the political solution for the country. Distractions like that of today only serve to delay the removal of ISIS from Syria.